Happy spring equinox all! I think by now the lighter evenings are so much more noticeable (I’m not so bothered about the mornings because it’s straight off to work) and it’s so lovely having walks or runs in the evening that are still in the light. Very good for the soul. Last Friday I had an email from parkrun saying that it was my 6 year parkrun anniversary on the Saturday- I started on the 16th March 2013, and this year the 16th also fell on a Saturday. To not make the numbers quite add up, it was my 189th parkrun (but then I remembered that the first time I was tail walker I didn’t realise I was meant to take a finish token, so technically I’ve done one more..)- anyway, on Saturday I was token sorting after running Ellenbrook, and in the volunteer email it turned out it was my 50th volunteer occasion which was quite nice timing. It was so windy on Saturday (yet again- another storm with another not-too-fierce-sounding name)- as the volunteers are meant to arrive at 8.30 I checked in and then ran up and down the runway a bit to keep warm (as I wasn’t needed until I’d finished running)- at least the wind direction meant it would be behind us on the final km. It was an enjoyable run, and it was nice to think about what parkrun has meant to be in these past 6 years. Dad persuaded me to go along, as he had done one at Wimbledon with the other tennis officials. I did think “I can just run 5k from my front door”, but once actually at a parkrun it all made sense. At first we only went maybe once a month, when we were all free, and I’d pick Dad and my brother up on the way. But once Panshanger started, it was far more regular, and became part of my weekend. I think it’s meant that I see my family more often. Since moving out my parents are still close by, but with lives being busy it isn’t always easy to make the time (and to find time that we can all do), but if we’re both around then we’ll text in the week and work out if we are meeting at a local one or going on a tourism trip, and Mum will offer to cook pancakes for breakfast when we get back. I love running with my dad too (or trying to keep up with him if he’s heading off on his own to run a bit faster), and chatting about how we found it once we’ve finished. Mum has been to a few trips with us, and when it was our 100th runs she baked loads of cakes and handed them out while we ran. I could probably ramble on for thousands of words about how great it all is, but I’ll leave it there for now. Token sorting in the wind was very stressful! The RD did say that I could leave it and he’d do it at home, but I felt bad after agreeing to do it. They have a little toolbox with compartments for each lot of 20 tokens, so in the end I sorted them into the tool box, although I could only do one at a time, opening the lid quickly and then shutting it right away so that the sorted tokens didn’t blow away. The unsorted tokens in the little bucket kept blowing away too- not very easy! 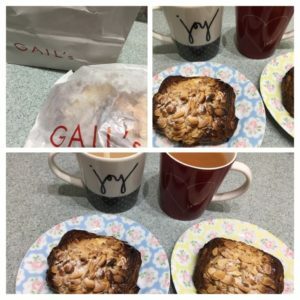 Once home (and after a shower to warm up) we had a late breakfast of chocolate almond croissants warmed in the oven (I’d been to town on Friday so of course I had to pop to Gail’s) plus a big cup of tea. I had some work to get on with, so I ploughed through it and then we walked into town later on to stretch the legs. 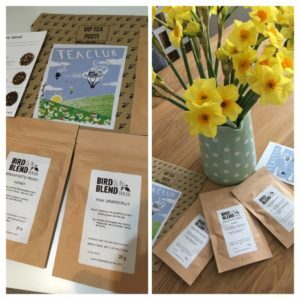 My tea club for March arrived, and I bought some mini daffodils to brighten up the dining room. On Sunday morning I headed out for a final long run before this Sunday’s half marathon- just under 11.5 miles in the end and it all felt good. Lots of signs of spring about, but also a few big trees that had blown down. After a shower and a big bowl of porridge, I got on with some life admin. Seriously, changing my name has been rather headache inducing- I had to submit a photo of my passport and wedding certificate 5 times to paypal before it was accepted! My driving licence arrived, I changed it with my running club and various online shops, signed up to the Brighton 10k (in my new name) and booked a hotel for that weekend. All very satisfying. After a quick walk we were off to the cinema to see Fighting with my Family, which I really enjoyed (I still don’t like wrestling though). On Monday I had to leave work with enough time to get to the opticians as I wanted to get the anti scratch coating put on the other pair. Work has been busy, so on Tuesday when Andy fancied a walk we decided to have a nice 3 mile walk instead of me heading out on a run- it was even light for most of our walk! 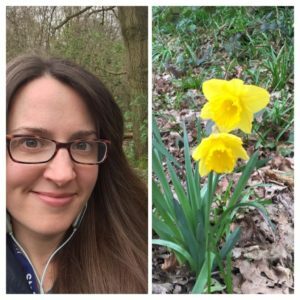 On Wednesday at lunch time I had a quick walk around the fields and woods- there were lots of daffodils and I saw so many little birds flitting about. That combined with yoga in the evening was a good way to celebrate the spring equinox. I’ve noticed that when my to do list gets long, I end up doing half of lots of jobs and not ticking off anything, and even though taking 20 minutes to have a quick walk can seem like I am spending 20 minutes not finishing things, it seems to give me a brain break that means when I come back I actually am more productive. Did you do anything to celebrate the spring equinox? At yoga we looked at the moon at the start and did lots of visualisations and breathing exercises to “clear out” the stale air and thoughts, and up our energy levels now that spring is here. (We also attempted the wheel pose- I still don’t have the upper body strength to lift my head off the floor, plus my ponytail gets in the way, but at least I can bend far enough to get onto my head). How do you organise your “to do” list? I love a list (I am one of those people who adds things to lists after I’ve done them just so I can tick them off) and have become a convert to Google Keep- I can have different lists for home, blog stuff, work, a shopping list, and although I do like a paper list, the fact I can add things wherever I am (either on my phone or laptop) means I am less likely to forget to do something. When is your parkruniversary? And how did you first hear about it? Author Maria RunsPosted on March 21, 2019 Categories General ramblings, Running, Stuff I love! 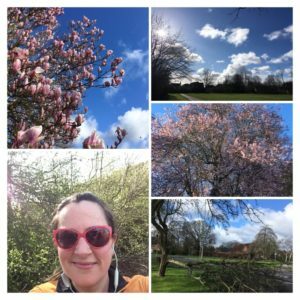 Running at the moment is just fantastic in the spring weather (storm Gareth, not so much). I just want it to last – rather than get sticky hot like it did last year. 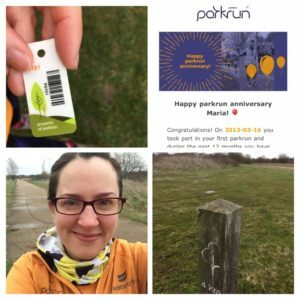 Congratulations on your parkrunanniversary! Wow how time flies eh. I can’t really remember my first one, I’ll need to dig it out of my blog records! Yes, the spring weather is perfect right now for running- long may it continue! Another busy week! Glad your last long run pre-half went well. So glad it’s not just me that’s bothered by giving storms names! I’ve always been one for a to-do list. I also re-write them when tasks have to be carried over! Glad it isn’t just me- maybe a teacher thing? My first parkrun was in May so I guess I’ll be celebrating my anniversary soon! I heard about it through university I think. My local at the time parkrun was organised by the university so was linked. That’s good- I think Ellenbrook has connections with the uni (although 9am on a Saturday may be too early for some students!). Next Next post: A Waffle House trip, fudge-making and my ultimate dinner!